The Olympic League Divisional Meet was held today at the Port Angeles pool. This meet is designed for those who have not qualified for Districts to have a chance to do just that. It was a lot of fun and all of the girls on our team swam better than they have all season. 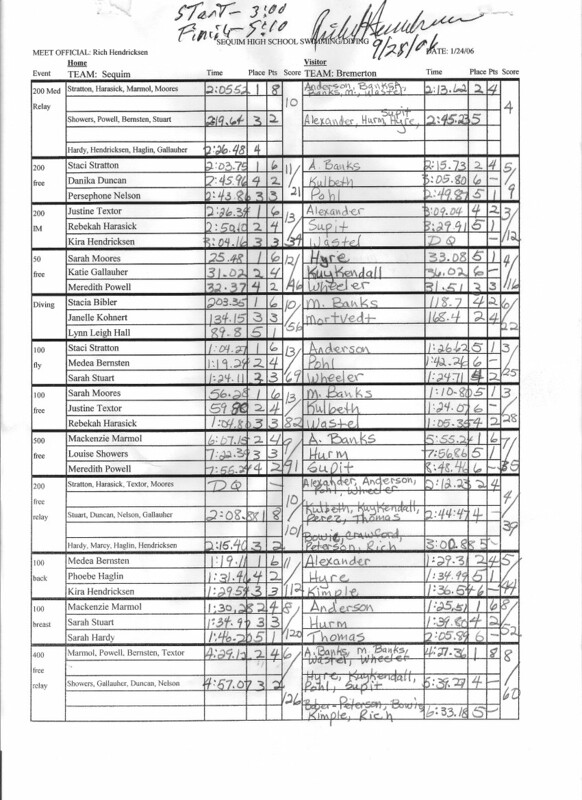 Team standings were not calculated because the meet was limited to a portion of each team rather than the entire team. All relays showed an improvement. Staci Stratton and Lynn Leigh Hall participated in diving today. Lynn Leigh dove well the first 8 dives, but did not qualify for finals. Staci (new to diving this year) qualified for finals and finished 3rd over all. Districts are next. 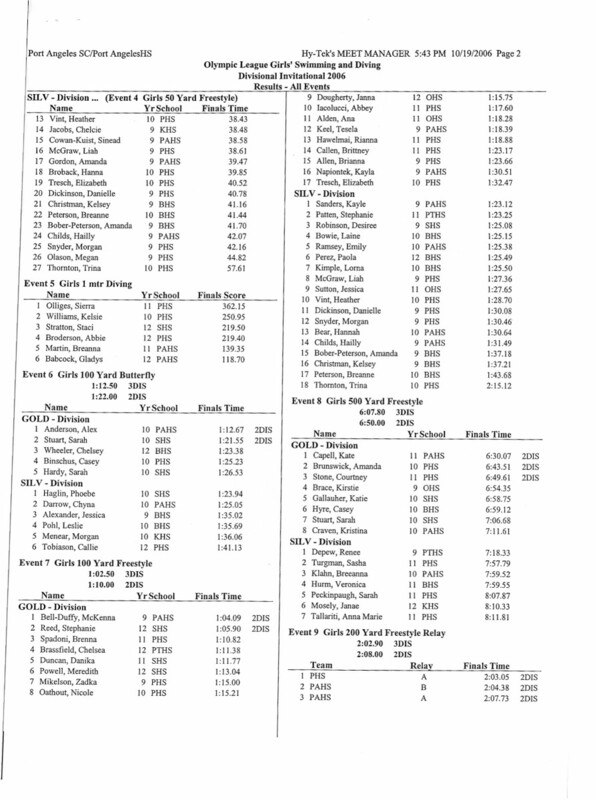 All but 1 swimmer has now qualified for Districts in at least 1 event. We swam against Olympic High School today and won with a score of 110 to 75. We didn’t have any new State qualifying times today. Staci Stratton tried to qualify for her 8th individual event for State so she would be eligible for the Ironman award, but she missed it by 3 seconds. Olympic High School did not have divers, so our divers took 1,2,3. We swam against Steilacoom and won with a score of 120 to 37. 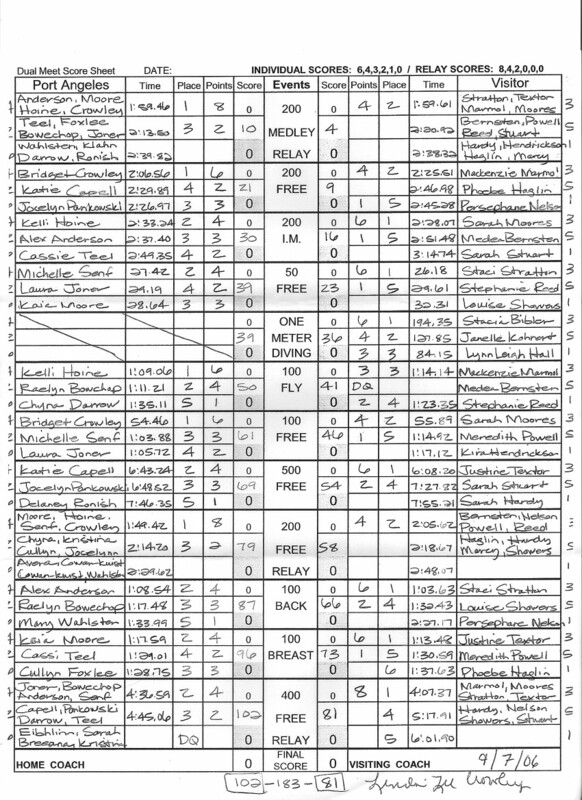 This was a non-league meet against another 2A school. All the girls swam greatt and have shown tremendous improvement lately. We had good news that Sarah Moores and Stephanie Reed will be able to swim the rest of the season. Staci Stratton in the 100 back with a best time by 1 second. Justine Textor qualified for the first time in the 100 fly. Rebekah Harasick in the 200 free, Mackenzie Marmol in the 200 IM, Medea Bernsten in the 100 free. We’re off to Olympic High School on Thursday for a meet against Klahowya. Today we swam against Port Townsend. Because they only have 10 swimmers, we predominantly swam our JV as varsity and reduced the number of relays entered to have a more balanced meet. It worked well as the Port Townsend swimmers placed 1st in half the events and many of the races were very competitive. This helped all the competitors achieve best times. I also swam most of the girls in events they don’t normally swim. There were a few surprises such as Medea Bernsten in the 200 IM dropping 7 seconds, Rebekah Harasick obtaining a best time in the 50 free, Persephone Nelson dropping 7 seconds from her best time in the backstroke that she just obtained a couple of meets ago. Overall, the girls competed the best I have seen this season with excellent effort on their turns and finishes. 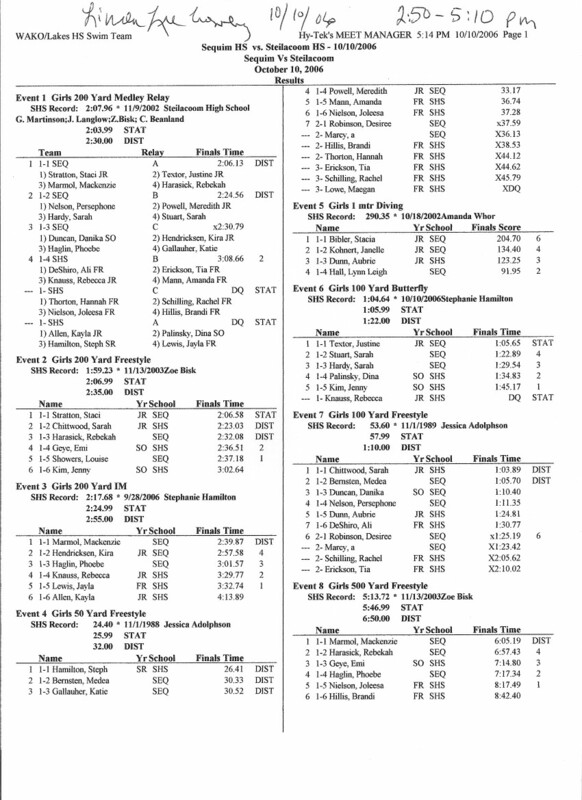 Justine Textor obtained a best time in the 100 fly with a time of 1:06.44, just 0.45 seconds away from the state time. Staci Stratton qualified for her 7th State individual event in the 500 free with a time of 5:35.30. District qualifiers included: Phoebe Haglin in the 200 free, Medea Bernsten in the 200 IM, Rebekah Harasick and Katie Gallauher in the 50 free, Sarah Stuart in the 100 free with a best time, Medea Bernsten in the 500 free with a best time. Stacia Bibler nearly broke 200 with a score of 194.9 in diving. Staci Stratton dove varsity today for the first time and scored 126.45 points for 3rd place. State qualifying: Staci Stratton in the 200 IM and 100 free. District qualifying: Medley relay A, Justine Textor, Medea Bernsten and Phoebe Haglin in the 200 free, Justine Textor, Sarah Hardy and Persephone Nelson in the 50 free, Mackenzie Marmol in the 100 fly, 200 free relay A, Mackenzie Marmol in the 100 back, Meredith Powell in the 100 breast, and 400 free relay A. 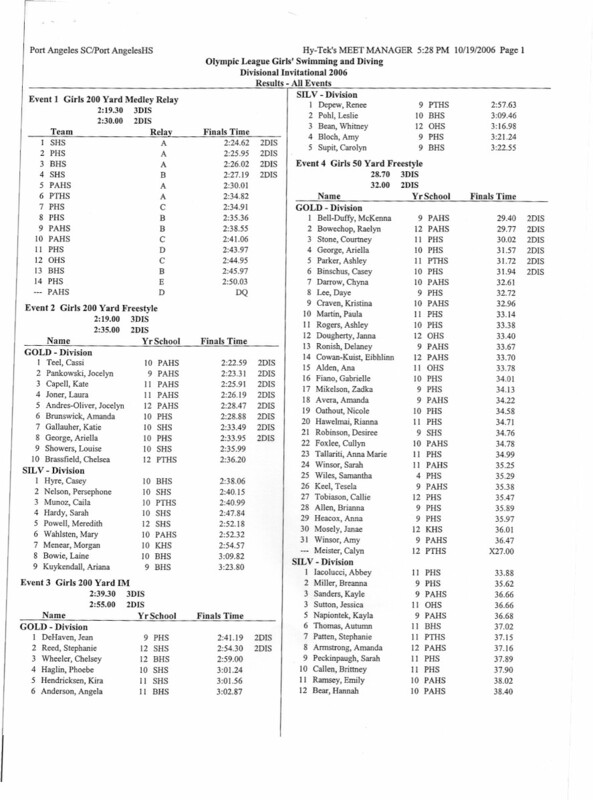 Best times included: Justine Textor in the 200 free by 12 seconds, Phoebe Haglin in the 200 free by 1 second, Staci Stratton in the 200 IM by 1 second, Louise Showers in the 200 IM by 1 second, Persephone Nelson in the 50 free by 1 second, Sarah Stuart in the 100 fly by 1 second, Phoebe Haglin (1 minute, 17 seconds) and Persephone Nelson (30 seconds) in the 500 free. The divers performed well and finished 1st, 3rd and 6th. They are all continuing to improve. The girls are performing very well at this point in the season. We are swimming Port Townsend on Thursday where we will give some of the girls a rest and allow others to compete that have not had as many opportunities this season. Sarah Moores and Stephanie Reed are on the disabled list for the time being. We competed at the Mukilteo invitational yesterday and placed 9th out of 31 teams. We placed 1st of the 2A schools. We qualified two more relays for State, the 200 free relay with Sarah Moores, Staci Stratton, Justine Textor, Rebekah Harasick and the 400 free relay with Sarah Moores, Mackenzie Marmol, Justine Textor, Staci Stratton and Sarah Moores qualified in the 50 free, Staci Stratton qualified in the 50 free and 100 free, and Justine Textor swam a qualifying time in the 100 breast. Almost district qualifiers include Phoebe Haglin in the 200 free, Louise Showers in the 100 free, 200 free relay B (Persephone Nelson, Sarah Hardy, Kira Hendricksen, Meredith Powell), Danika Duncan in the 100 breast, 400 free relay B (Katie Gallauher, Phoebe Haglin, Sarah Stuart, Medea Bernsten). In diving, Stacia Bibler placed 4th, Janelle Kohnert placed 19th and Lynn Leigh Hall placed 33rd. We won our first League meet against Bremerton today with a final score of 126:60. We placed first in 8 of 12 events. 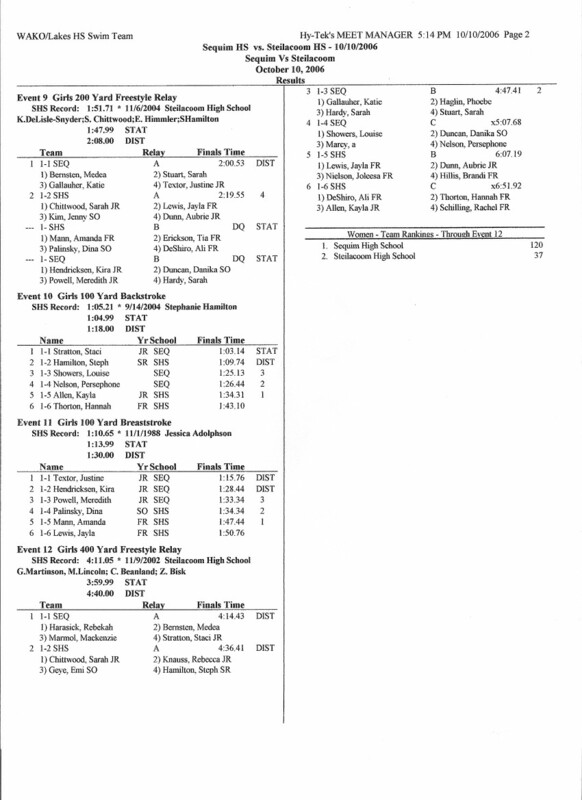 We qualified in 4 events for State as shown below. We qualified 10 times for Districts as follows. Our divers took 1st, 3rd, and 5th. Stacia Bibler scored enough points to meet the qualifying standard for Districts, however must still qualify at an 11-dive qualifying meet. The amazing story today was Katie Gallauher who just joined the team this fall with limited swimming knowledge and ability. She qualified for Districts in the 50 free. Way to go! 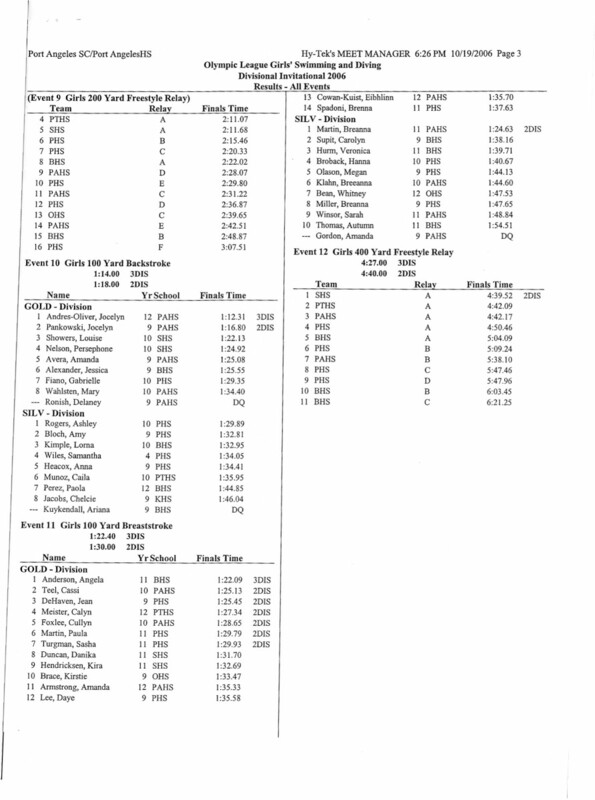 We swam against another large school in our league, Peninsula HS, and although we swam well, we were outscored. The final score was 102-84. The divers scored 1st, 3rd and 5th, although the results do not show that. 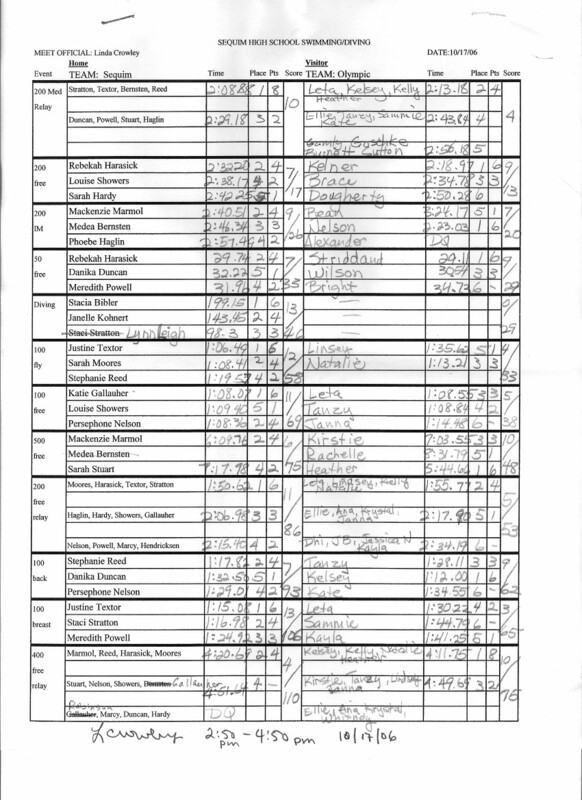 There was an error on Stacia’s final score, that when corrected put her in 1st place. Overall the team is improving and dropping times. I look for ward to our meet against Bremerton on Sept. 28th. We had our first meet today against Port Angeles. 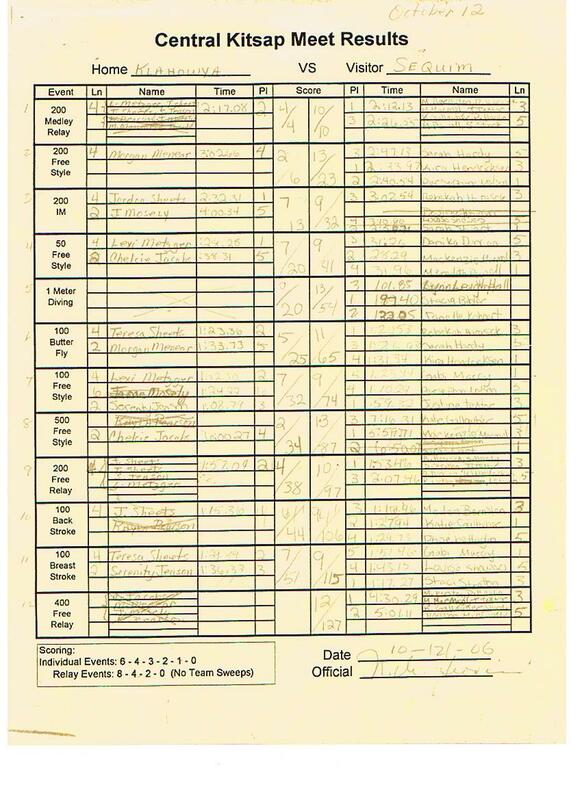 As in the past, PA had many more swimmers than we had, but the final score was close: PA 102 to Sequim 81. It was a good first meet and will be useful in determining where we need more work. 200 Medley Relay (Staci Stratton, Justine Textor, Mackenzie Marmol, and Sarah Moores) with a time of 1:59.61 (state time is 2:03.99 for 2A). 100 free Sarah Moores with a time of 55.89 (state time is 57.99). Sarah Moores and Medea Bernsten in the 200 IM with times of 2:28.07 and 2:51.48 respectively. The divers placed 1st, 2nd, 3rd overall and dove superbly! Overall the girls swam well for this time in the season and we are all happy that we have qualified for State in 4 events and Districts with 9 swimmers already. Our next meet is with Peninsula on Sept. 14.